Here at blc EVENTS, we take great pride in creating unique celebrations that exceed our clients’ expectations every time. After each success we are fortunate enough to be a part of, we wonder how we are going to top it. Then we get a call from our great clients Jim and Tracy, for a holiday fest that pulls out all the stops…on a Sunday. Yes, this Portland party planner is up for the challenge and no detail will be overlooked! 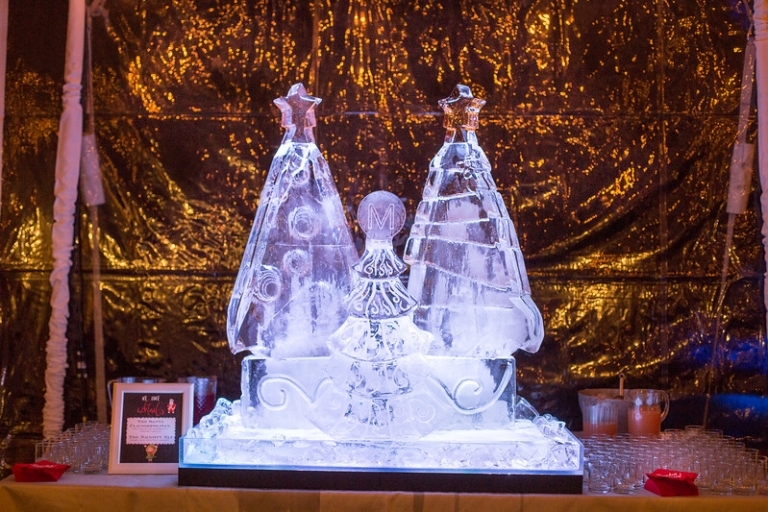 Custom ice sculpture shot luge? Check. Santa and naughty elves? Check. Halls decked in spectacular fashion? Check. Signature holiday cocktails, delectable dinner, desserts worthy of the big man himself? Check, check and check! This holiday party had everything and then some. The hosts, the guests and even the event staff had a memorable night making merry at this December extravaganza! We set the stage starting with the fabulous invitations from Crave Design (who also provided the clever signage throughout the party). Santa’s helpers greeted guests at the entrance with the evening’s signature cocktails from the ice luge – the Naughty Elf and the Santa Clausmopolitan. The entire property was lit up merry & bright for the occasion thanks to Greenlight Creative, including the cozy tent we had brought in to house the dance floor. Haute Flowers really outdid themselves with gorgeous flowers and decor throughout the entire house. 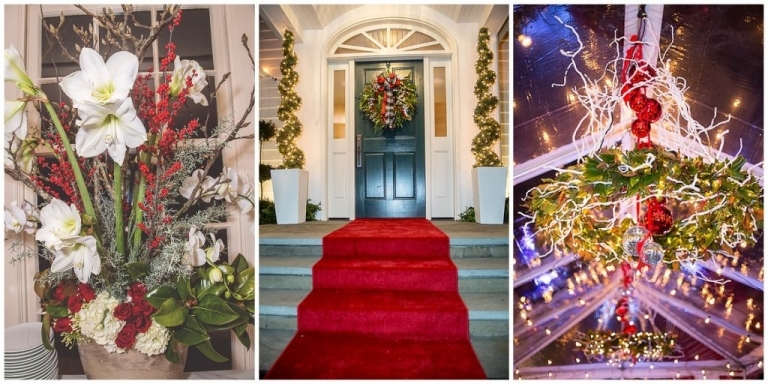 Christmas lillies, holiday greens and custom floral chandeliers created a festive atmosphere. There was even a nod to the holiday classic A Christmas Story. The food spread? We’re running out of adjectives, but let’s just say Art of Catering killed it with the custom cocktails, ahi cigars and a pasta station featuring the giant wheel of parmesan. Their desserts were to die for – peppermint milkshakes with a candy cane rim and chocolate chip bacon cookies (My mouth is watering just thinking about them). Finally, the entertainment, because everyone definitely needed to burn off some of the holiday spirits and you can’t have a holiday party without a photo op with Santa! Mark Larson Santa and Stumptown Photo Booth added just the right element of fun while DJ Zimmie kept the dance floor prancing into the wee hours. When guests finally had to take their leave (because Monday), they were treated to sweet custom cookie favors just for them. Happy Holidaze, Morse Family! Thank you for letting blc events drive the sleigh for this occasion. Not sure how we will top this one friends, but we’d sure love to try! © 2019 BLC Events|ProPhoto6 Blog|Design + Dev by Northfolk & Co.